Single page websites have been growing in popularity over the past few years as more and more organizations and companies prefer them to the popular elaborate multi-page websites. This is because the focus of one-page website design is to remove all the clutter and bring the users’ attention to the most relevant content. A one-page website may be easier for users to navigate if the majority of visitors are coming from a mobile device. 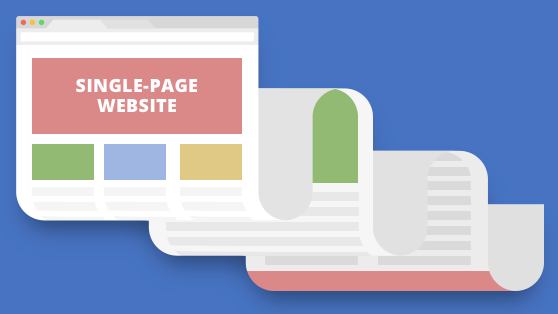 A one-page website will generally load faster than multiple page websites. One-page websites are great to target a specific audience, if the content is targeted. A one-page website can provide higher page authority because every link to the website will only go to the home page, giving you a 1:1 ratio of links to pages. One-page websites are generally cheaper and faster to create/maintain. One-page websites usually have higher conversion rates since all the traffic is funneled into one place. One-page websites don’t allow for wide keyword targeting because every page has a new opportunity to rank to a specific audience. One-page website content lacks details. You’re unable to have detailed content for every major topic you want to cover, potentially leaving visitors disappointed or frustrated. One-page websites don’t allow for some Advanced SEO including organizing your website into categories and subcategories. One-page websites may require extra work for SEO. Since there is an absence of content, you’ll have to rely on building backlinks to drive rankings and traffic. One-page websites make it more difficult to implement and analyze performance in Google Analytics and other metrics. One-page websites will require more time to strategize and plan the content on the page to target the key audience you’re looking to attract. So now that you know the fundamental reasons why a single page website might or might not work for your ministry’s needs, you can make a more informed decision on how to best reach your audience online. There are many things to consider when deciding on how to present yourself online, and it’s great to get creative in the process. But most importantly, you have to do what is best for you and how your content needs to be organized to best reach your audience. Wondering how to proceed with you website needs? We can help!